Max Size: 5" / 12.5cm , though 4"/10 cm is more common for captivity. 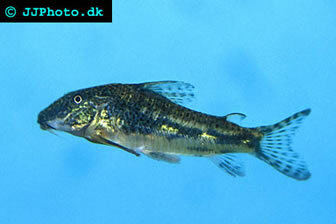 Water Parameters: The Bearded Cory does best in conditions similar to other "Corys". Low to moderate PH,(5.5-7.5), Low to medium dH,(2-22), Temperature, 65-79 F (18-26 C) Water parameters are not critical for this species unless breeding is to be attempted. Aquarium Setup: The bearded cory should not be kept in aquariums smaller than 20 gallons / 100 L. Sand or gravel substrate, rough substrate is not recommended. This species love a planted tank with driftwood. Sexing: The dorsal and pectoral fins of males reach almost to the caudal peduncle, and develop whisker like stubble around their mouths, called odontodes. Males also tend to be larger, and more colorful. 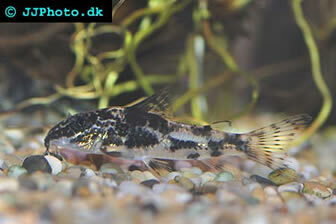 Breeding: Not especially difficult to breed, but behavior can differ slightly from corydoras species as this species belongs to a different genus, Scleromystax. As always using cooler water for water changes can induce spawning.